The Egyptian vulture (Neophron percnopterus Linnaeus, 1758) is the smallest among the vultures of the old continent. It belongs to the order of the Accipitriformes and to the family of the Accipitridae. Many facts and anedoctes surround this vulture, a raptor once quite common and nowadays in strong decrease in all its range. Like all necrophagous bird also this vulture nourishes of carrions and of all what looks like food rightly deserving the name of “scavenger of the sky” but in its case a somewhat extraordinary particularity has been found that places it in a privileged position in respect to the other vultures. It was thought that only few mammals might reach an evolution degre such to lead them to use tools for getting the food, but with the Egyptian vulture the group of these animals has widened also to the birds. Some decades ago it was noted that this vulture being close to an abandoned ostrich egg tried unsuccessfully to open it with strong pecks but, as is well known, the shell of this involucre is several millimetres thick therefore its attempts were constantly vain. It is not known how this did happen, but later on it was noted that one of these birds, once taken a stone and having accidentally banged it on the egg, did nick it thus having the possibility of introducing there the beak and so widening the hole for eating the contents. 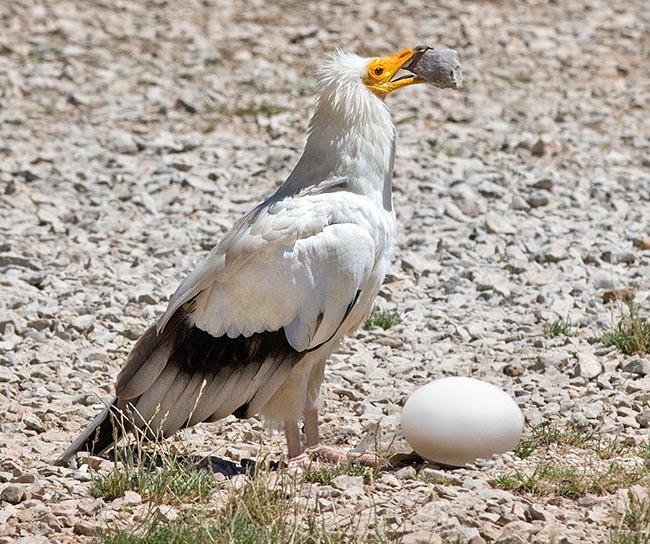 Not all egyptian vultures are able to repeat this rule, but its has been noted that an increasing number of them have learnt to use this tool for opening the eggs. This operation can be done of course by the African subjects seen that the ostriches live only in this continent. Amusing is the fact that Linnaeus when classifying it used the term Neophron that in the Greek mythology represented the son of Aegypius transformed by Zeus, after a licentious family adventure, rightly into a vulture, bird once deemed as little intelligent. The specific name percnopterus comes from the Greek “perknos” = dark, black and “pteron” = wing, because of the contrast of the wings when flying. Due to a clerical error indicated it initially with perenopterus but later on they saw the mistake and took the name back to the right spelling. The Egyptian vulture is also the bird represented in the Egyptian hieroglyphs and was worshipped by this people as a deity dedicated to Isis; as a matter of fact, numerous mummies of vulture have been found even in their tombs. Moreover, the old Egyptians used the representation of a vulture as symbol of nobility therefore the royal protection it enjoyed did render this species very common in their cities. For such reason, in English this raptor is called also “pharaoh’s chicken” and in Italian “Egyptian vulture” as well. Also the French have given it various nicknames: from Alimoche to Catharte alimoche and also Marie-Blanque, name that later on was given to the Col de Marie-Blanque, a hill of the Atlantic Pyrenees where frequenty it was twirling. In India this bird was accustomed to visit the Tamil Nadu temples where they could get food from the hands of the local holy men and, in the Gujarat Zoroastrian temples, for participating to the macabre banquet of the lifeless bodies left expressly on the “Towers Of Silence” to be eaten by the vultures and then to enjoy of the celestial burial. Also the Bible often talks of this bird so it is possible that some of its behaviours have moved in the old times religious concepts nowadays unclear to us. A final anecdote refers to its very bad though natural habit placing it among the few coprophagous species. It has been often remarked that it loves eating the excrements of some animals in order to get the beta-carotene, element necessary for colouring its cere. The Spanish vulgar name is much right, churretero or moñiguero, literally eater of excrements. These are some of the other vulgar names used in Europe : in England, Egyptian vulture; in France Vautour percnoptère, in Germany Schmutzgeier and in Spain, Alimoche comun. 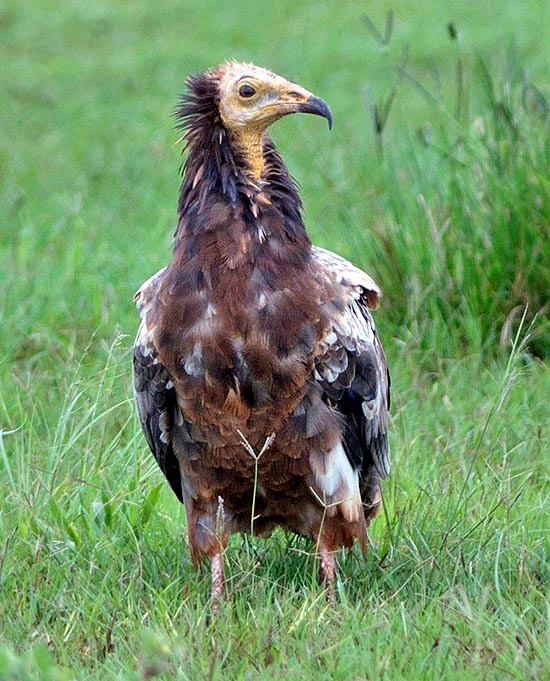 The Egyptian Vulture is diffused in some European regions, in Asia, in Africa and in the Cape Verte and Canary Islands. It is in drastic decrease in Europe and in Italy is close to extinction. Areas like Sardinia and Sicily that decades ago saw a substantial population, have now a number of nesting pairs of quite a few units. The most important mediterranean population is that of the Iberian Peninsula, of Anatolia and of Morocco. In Africa, its presence is restricted to the sub-Saharan belt from Mauritania to Ethiopia and locally in Namibia but is absolutely absent in the rest of the continent. In Asia, it is present in the central area up to the western limits of China and southward in all the Indian subcontinent. 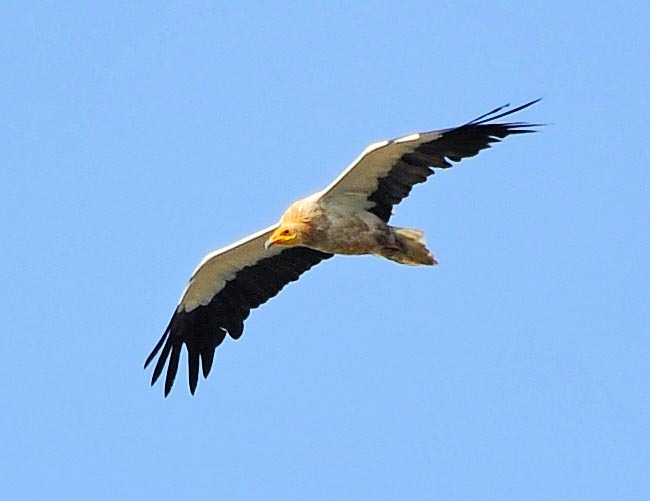 The Egyptian vulture living in the temperate zone is typically a migrant and spends the winter in Africa for the European part and western Asian parts, in India for the central-Asian one. Conversely, it’s sedentary in the tropical areas. In all its range it is getting a strong decrease mainly due to the use of poisoned baits, the poaching and the transformations of its habitat. Also the commotion caused by the tourism and by the hikers has caused especially in the Mediterranean area, the abandoning of their old nesting sites permanently driving away this bird from places inhabitated traditionally since centuries. 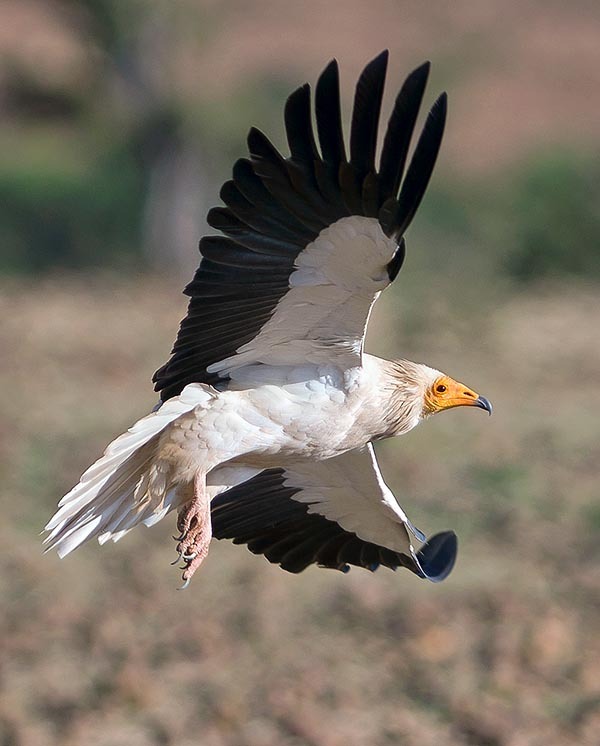 The Egyptian vulture lives in places frequented by herds and pastures but also where the big game is abundant. Its diet is conditioned by these presences but it does not disdain to gulp whatever carcass, whether of fishes or of reptilians, of big insects or invertebrates. It does not fail even to rummage through the garbage, therefore it is a vulture frequenting also agricultural villages or outskirts of densely populated cities. Necrophagous, it is often observed while sharing its meal with other vultures but keeping behind awaiting the bigger and more robust ones to complete their banquet. Like all its akin it may at times gobble huge quantities of food remaining then, however, easily fasting even for weeks. Another necessity is that to have available rocky and inaccessible slopes without which it could not nest. Contrary to any vultures, the Egyptian vulture is usually more solitary in its habits and less gregarious during the nidification. 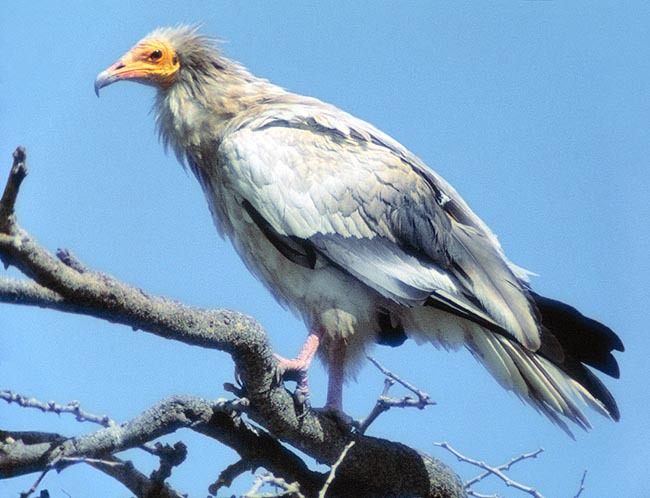 Though considered as being among the smallest vultures the Egyptian vulture has discrete size. It may have a maximum length of about 80 cm, a weight up to 2 lg and a wingspan reaching even the 180 cm. It is the only vulture having the face completely yellow with concolorous cere, colour covering almost completely the beak. This one is remarkably elongated and thin, with rather arcuate and pointed blackish tip. The plumage is totally white with a slight yellowish shade on the nape and on the throat but the much black remiges when in flight do create a remarkable contrast with the rest of the body. The tail is rhomboidal, characteristic rendering it easy to distinguish from the other vultures. This is a characteristic shared with the bearded vulture (Gypaetus barbatus) even if this one is remarkably bigger. The juveniles have a very dark colour but show a completely whitish bare face, the same will get coloured in yellow around the fifth year of age, when the maturity will be reached. The iris is black and the legs are yellow at all ages. Extremely slight dimorphism between the sexes difficult to be noted on the field and detectable only observing a blackish shade present in the male close to the eyes. Three distinct subspecies have been recognized, one particular to the Canary Islands, one to the Indian subcontinent and the third one located in the rest of the range. 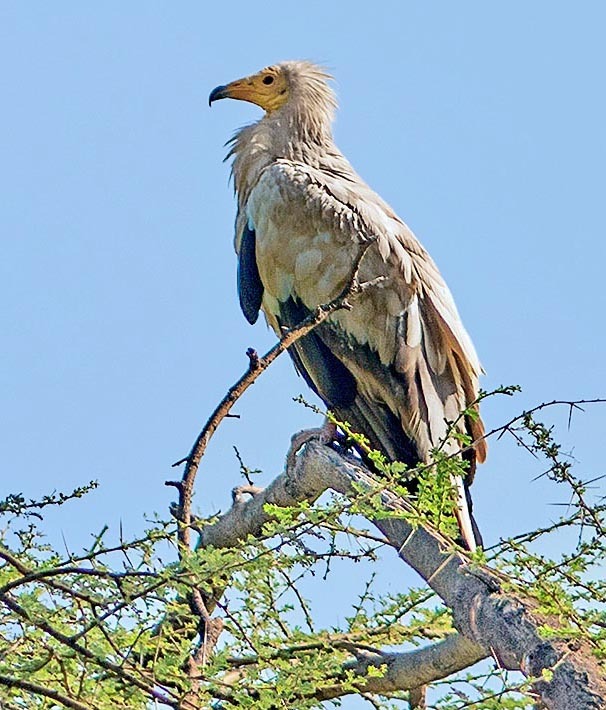 The Egyptian vulture reproduces by the fifth year of age and places the nest in any ravine or hole in rocky walls provided it has a covering for sheltering from the bad weather. The nest may be located also on sea cliffs but these ones must be necessarily inaccessible to possible terrestrial assailants. In some habitats it may also use big trees. The habit of coming back to the same place of nesting for quite many years, renders some times its nests enormous masses of materials of all kinds. Usually, it utilizes twigs and dead branches but integrated with any other material including even bones and leftovers. It nidifies also in small colonies with nests even very close each other and during this time the pairs are extremely elusive and reserved, so much to oblige them to abandon historical sites when continuously disturbed by the human presence. The pairs are monogamous and can be stable for many years. Usually, they lay two white eggs spotted in reddish ocher with dark dotting enhanced on the bigger side that are bred for about 40/45 days and hatching at 5 days intervals one from the other. The young keep in the nest for a minimum of 80 days, but after their first flight, they depend totally from the parents for several more weeks. The nestlings can be predated by eagles, eagle-owls and, on the ground, by foxes and jackals. Once reached Africa during the first migration, the juveniles can remain up to three years in the wintering territories going back to the native places only when subadult or when the maturation is reached. They can live more than thirty years when in captivity and about twenty in nature. Falco montanus aegyptiacus Hasselqvist, 1751; Neophron perenopterus Linnaeus, 1758; Vultur perenopterus Linnaeus, 1758.